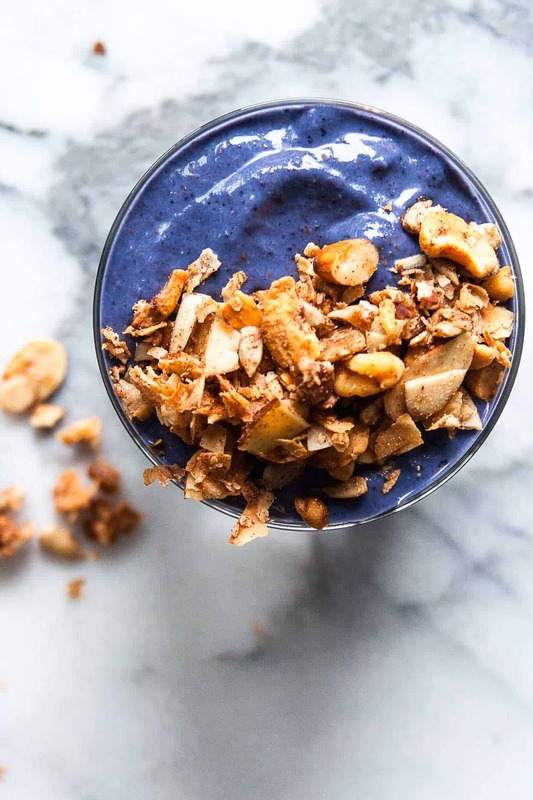 Turning a breakfast classic into a smoothie with this blueberry muffin smoothie! Packed with hidden veggies and lots of goodies, this smoothie will keep you full for hours. One thing that I really missed while doing the Whole30 was smoothies. Smoothies topped with my grain free granola to be exact. Yep, these three ingredients are key to keeping you fuller longer. I’ve done a lot of reading and podcast listening about how to elongate your blood sugar curve so you don’t go through spikes and crashes throughout the day. I could go into serious detail about the science and biology of this; but it all boils down to the macros in your food. Just trust me when I tell you that making sure you have protein, fiber, and fat will help elongate that curve and keep you satisfied. Now, on to the Blueberry Muffin Smoothie! I love this smoothie for so many reasons. First of all, YUM. 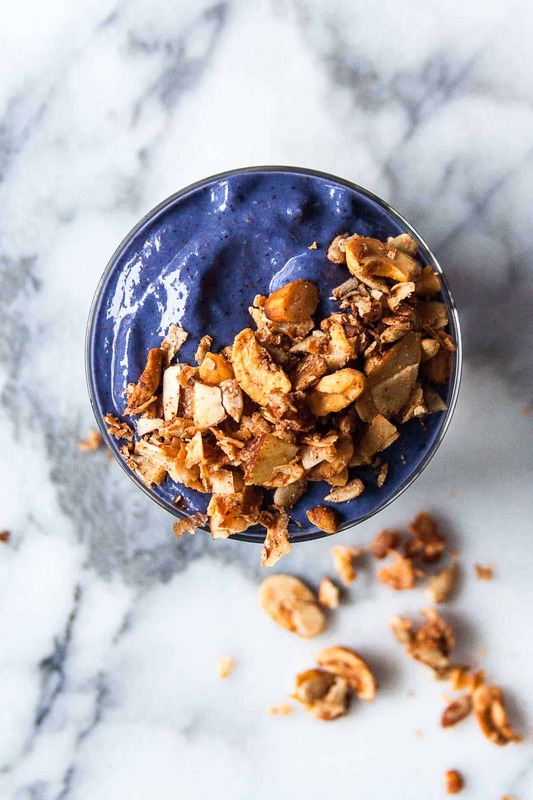 Blueberry muffin in smoothie form?! You know I’m obvs into this. Second, there are hidden veggies inside… and frozen cauliflower is my veggie of choice! It adds thickness and bulk to the smoothie without adding the cauliflower flavor. Third and most importantly, I add protein powder to all of my smoothies. This is KEY to keeping me full. 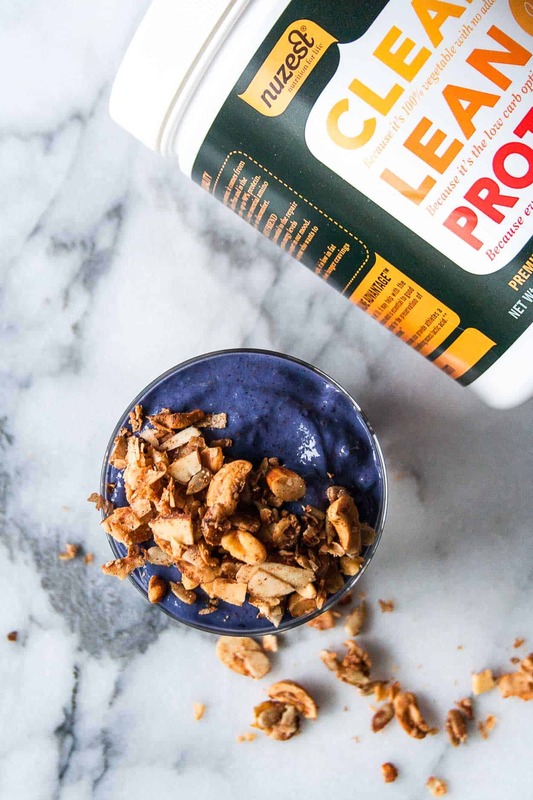 I always use Nuzest Clean Lean Protein – their rich chocolate is my favorite, but the pure vanilla was perfect for this recipe! Also, if you follow this link, a 15% discount code will automatically be applied to your order – how amazing is that?! For fiber, I added a tablespoon of flax meal; but you will also get added fiber from the blueberries, cauliflower, and granola. Lastly (and arguably most importantly, FAT. Healthy fats are my jam. 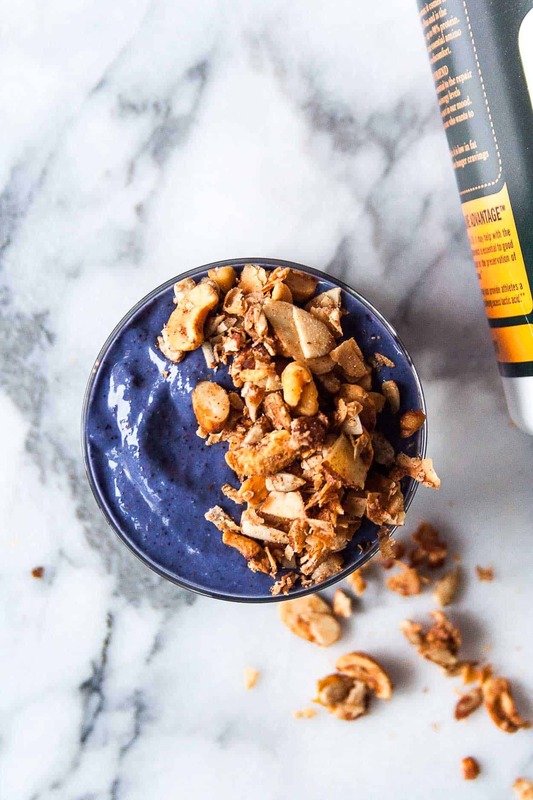 I’ve been very conscious of adding healthy fats to all of my meals and have noticed a huge shift in my satiety levels – it’s been a game changer. I mean, who doesn’t want to eat nut butter or avocado at every meal?? So I added almond butter to the smoothie in addition to the healthy fats found in my granola. What are you waiting for?? 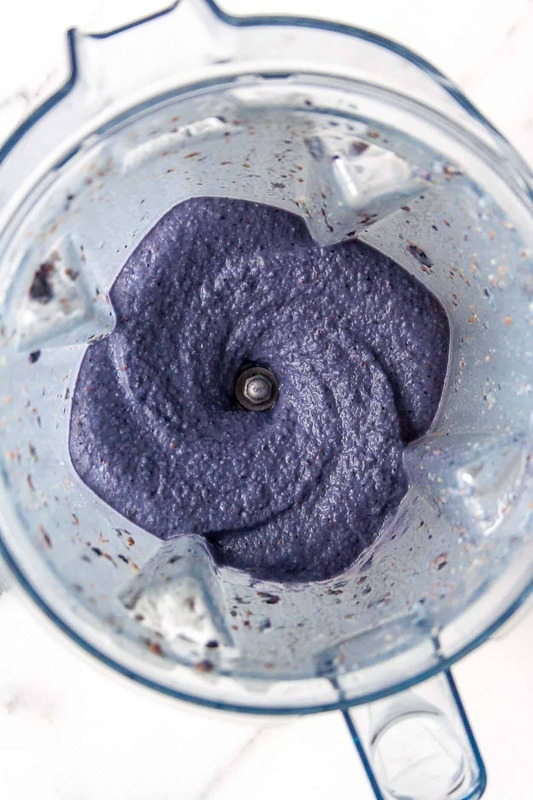 Go make this blueberry muffin smoothie right now! Add all ingredients to a high powered blender and blend until combined. Top with Hungry by Nature’s grain free granola and ENJOY!